Wire Die Springs are heavy-duty metal compression springs, designed to store more energy in a smaller space than round wire springs can store. They meet the demands of heavy stress, heavy load applications, such as punch presses, die machinery, automotive brakes and clutches, farm machinery, and aerospace. 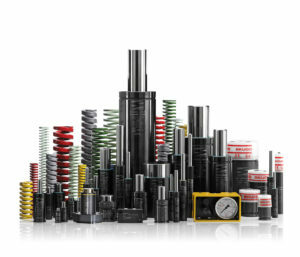 Die Springs manufactured by Special Springs uses ‘CAD Springs’, a revolutionary, integrated software program to calculate, select and generate precision products. Precision Punch offers a full choice of color-coded wire die springs made from rectangular, round and oval wire to meet a wide range of specifications, ranging from light-load to extra heavy-load. We also offer a full line of Nitrogen Gas Springs. Precision Punch and Tooling’s signature quality and precision, and Special Springs’ high level of dimensional accuracy, durability and reliability. That’s why many of our customers use these springs along with Precision Punch and Tooling products for injection molding, metal stamping and in tool and die shops. Competitors’ parts can easily be cross referenced. Hole diameters for wire die springs range from 10mm up to 63mm; body diameters of gas springs range from 12mm up to 195mm. We offer both rectangular and oval styles of wire die springs. We keep more items in stock to get you back on track faster. Valid on any in-stock product ordered. Spring rates ranging from Ultra Light Load up to Ultra Heavy. We stand by our products and offer a 2-year warranty. Reduce the risk of tool damage or personal injury due to ejection of parts under pressure.